Learn how to better understand the Interpreting process and how to get the most of your interpreting budget. 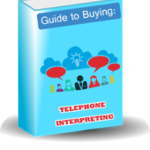 For non-linguists, buying interpreting services is often frustrating. By hiring a professional interpreter, you are harnessing the power of language to make sure your message gets across. You are also ensuring that investments you’ve already made are not wasted, and reducing risk for yourself, your partners and your clients.